b2b brands: #ThrowbackThursday - What is This Strange Power Paper Holds for Writers? #ThrowbackThursday - What is This Strange Power Paper Holds for Writers? Admittedly, we write a lot around here. In fact, we write more than a lot -- by some standards we write to excess. From ebooks and ads to strategic plans and articles undertaken for ecotech and high tech clients, we live and die by our writing. Our industry focus has grafted these phrases and concepts onto our DNA. Usually. The other day, however, when someone in the office casually commented "... you know, for an office full of tree hugging techies, we sure use a sh**load of paper ... ," I was a little taken by surprise. Surveying our work space, sure enough, everybody has his or her stash of notebooks. The wastebaskets are half-full of discarded brilliance in hardcopy. Some of us even have semi-sacred journals that are referred to variously as "My Brain," "The Magic Moleskine" and "Her Grimoire." (The latter is an unfortunate third-party reference to my own journal of drafts, ideas, inspirations and diabolical plans). Our special journals are either Moleskine(tm) products or some other fancy schmancy, paper-filled tomes -- and we genuinely treasure them. For me, writing in my "special" notebook somehow gives texture and substance to abstractions. It also corrals information for me, keeping it in-hand, under control, literally at my finger tips and holds the words still if I need to edit or rewrite any of them. I know my laptop can do all that, yet somehow it just doesn't do it as well. "The feel of the cover and paper helps me think." "If I'm writing something that's important to me, it needs a more permanent medium." "I write better when I can -- I don't know -- 'touch' the words. Is that weird?" Okay. Not logical, but consistent. Then I began to wonder if this was an isolated, creative culture phenomenon. So, I cast a wider net and started researching. What I found was that our attitudes toward paper are, in fact, pandemic. 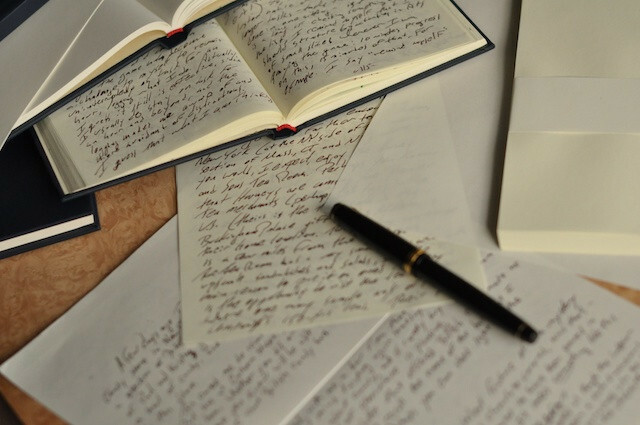 The use of paper among writers is experiencing a dramatic resurgence (if it ever experienced a decline), to the extent that it recently caught the attention of several NPR commentators who have covered it several time in the past few months. Even more interesting, however, is the evidence that writing on paper is actually good for us, or at least our cognitive performance. A recent study, conducted by Pam Mueller of Princeton and Daniel Oppenheimer of UCLA, examined the effects of taking notes in longhand versus note taking on a digital device (i.e., laptop). The results clearly indicated that "... students who took notes on laptops performed worse on conceptual questions than students who took notes longhand ..." Mueller and Oppenheimer report that longhand note taking appears to require a higher level of cognitive engagement with the subject matter than the act of transcribing content digitally. I find it comforting to know there's a sort of business case for the attachment we feel toward our notebooks and journals. Right Brain and left brain are in harmony, and all is right with the world. "Don't Write Off Paper Just Yet," Morning Edition, NPR, May 2015, http://www.npr.org/2015/05/26/408794149/dont-write-off-paper-just-yet. "The Pen Is Mightier Than the Keyboard: Advantages of Longhand Over Laptop Note Taking," Psychological Science, January 16, 2014, http://pss.sagepub.com/content/25/6/1159. "In A Digital Chapter, Paper Notebooks Are As Relevant As Ever," Morning Edition, NPR, May 2015, http://www.npr.org/2015/05/27/408794237/in-a-digital-chapter-paper-notebooks-are-as-relevant-as-ever.